HomeKicking The Tires On A New Car…And On A New Investment. 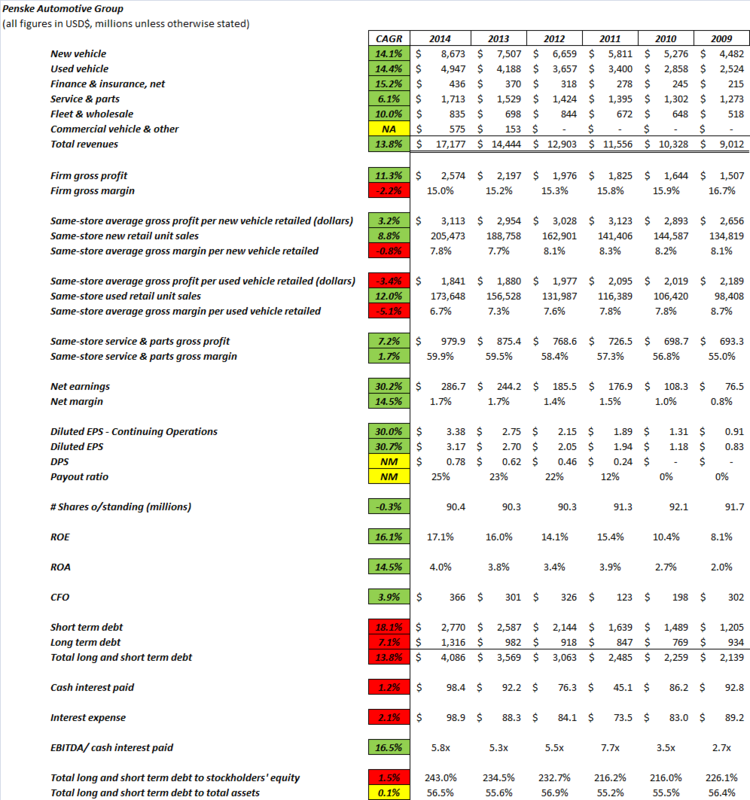 Despite operating in a very competitive environment, the Company is still managing pretty decent margins on the new and used vehicles it retails (principal operating segments). Growth has been a combination of both organic activities and M&A. The automobile market is still very fragmented and there remains significant future potential for consolidation. I like the “one stop shop” concept covering third-party financing and insurance…decent margins for arranging finance and insurance with usually low associated costs and risks to the Company. Though diversified by marque…focus on premium segment (72% of 2014 automobile dealership revenue) should limit negative revenue impact from pending interest rate rises. Furthermore, the large fixed costs automobile manufacturers have to contend with means it is in their best interest to actively improve sales and marketing efforts (for all marques, premium or not) during the not-so-good times. While not unassailable, the automobile dealership business does have barriers to entry such as reputation of franchisee, capital requirements, and physical location of plant. Diversified revenue streams (new cars, used cars, service and parts, finance and insurance, commercial vehicles and parts). My main area of concern is the Company’s debt level, with total debt rising an average of 14% annually over the past five years. However, the fact that the larger part of that debt growth was due to floor plan financing and not rejigging of the Company’s capital structure (i.e. overloading on debt to facilitate a large special dividend) mitigates my concern somewhat. Rising coverage ratios (5.8x versus 2.7x) further mitigates the “sting” from rising debt levels at PAG. A more pressing issue is the effect the Volkswagen emission scandal has on the Company since VW and Audi accounted for 15% of total retail automotive dealership revenue in 2014. News of the scandal broke in September, so any effect will likely be felt in towards the end of Q3 into Q4…watch this space. As mentioned in the “My Investment Philosophy” page, I believe dividends are key to successful long-term investing. Save for the two years in 2009 and 2010 when PAG did not declare dividends, the Company’s quarterly dividend has risen from 5 cents in 2003 to 25 cents (17 consecutive quarterly dividend increases). PAG is currently yielding a modest 1.8% but with good long-term prospects and an equally modest payout ratio of ~ 25%, I see further dividend increases in its future. PAG is currently trading at a TTM PE of 14.47x…not cheap but not overly expensive in my mind given future growth prospects. What do you think of PAG as a long-term investment?